The Godfather – both Mario Puzo’s novel and Coppola’s subsequent movie trilogy – is without a doubt one of the most famous and most re-run movies of the previous century. It is quoted daily, it is a source of inspiration and has provided many a credo to live by. Fans claim it can answer any dilemma you have, from when will we meet – “Monday, Tuesday, Thursday, Wednesday, Friday, Sunday, Saturday” – to how to deal with an issue at work – “Go to the mattresses”. The mafia and the legends it has inspired have been a part of Sicily and the way we perceive it for centuries – Puzo and Coppola have only made it more poignant and more approachable. The island in the Mediterranean is visited by tens of thousands of tourists each season – and many will never be interested in the lore and the myth at all. However, if you are a fan of the Corleone’s and are still seething at the betrayal of Carlo Rizzi and would like to shake hands with the Don himself, here is a small taste of the Sicily that was immortalized through Coppola’s lens. The town of Corleone itself is located about 60 kilometers from Palermo, the capital of Sicily, near the Rocca di Maschi. Note that this is not the place where the movie scenes set in Corleone were actually filmed. The main reason for this migration is the fact that the town was already much more developed than it ever was in the middle of the 20th century when the filming took place. Throughout history, the town of Corleone has always been the home to the Corleonessi clan and its members of the Cosa Nostra. Between 1944 and 1948, there have been 153 violet deaths registered in this small town – needless to say, its male population has dwindled. Vito Corleone, the Mafiosi in Puzo’s tale is thought to be based on Carlo Gambino, a real-life Sicilian mobster. Another infamous member of the mafia is in fact also from Corleone – Salvatore Riina. While it was never featured in the movies, the town of Corleone is an absolute must on your itinerary while on Sicily. While there, make it a point to visit both of the churches, the San Martino and the Santa Rosalia, and drink in some of the ancient Sicilian air. A village that was used as a setting in the movies is Forza D’Agro, and you can still find it atop a steep trail leading to the mountains. The first thing you will notice about it is the castle, from where you will have splendid views of the Messina, all the way out to glorious Taormina. Scenes from the second and third installment were filmed here, most notably in the Godfather II – where young Vito is fleeing Don Ciccio’s men – you will recognize the church. The village is today not much of a sight, and it is mostly visited by fans – there is but one restaurant and a few bars, the church is in a worse state than half a century ago, and you will probably not linger too long. 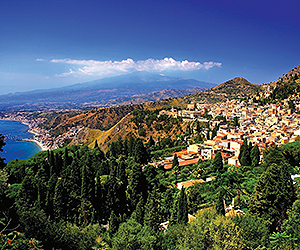 Savoca is certainly a sight you will recognize instantly – in reality, this quaint village is located about 20 kilometers outside Taormina, and has breathtaking views of the sea. Naturally, those views were carefully edited out of the movie, as Corleone is located much further inland. Savoca is home to the Bar Vitelli, where today you can find a gallery of memorabilia and photos taken during the shoot. It has barely changed since then in truth – the curtains are still there, and they still lead into the cool shade of the bar. You can just about imagine Apollonia somewhere inside. The village is also where you will find the church where Apollonia and Michael are married, the Church of Santa Lucia, very near the Bar Vitelli. You can walk the same road the wedding guests crossed all those years ago, and imagine yourself present at that moment in time. Don Tommasino’s villa is located in Fiumefreddo, called the Castello Degli Schiavi in real life. This is where Michael made his home while in exile, and where Apollonia learns to drive and where she meets her death. This is also where Michael dies, at the end of the third installment. You can find the castle rather easily, on the road that runs from the town to the coast. However, it is a private residence, so you should not go barging in and ask to take some photos. Outside the gates is perfectly fine for you to say farewell to the spirit of the Corleone family. The Sicilian capital is also a prominent setting in the Godfather world. Its 19th-century theatre, the Teatro Massimo is now even more famous, as the backdrop of all the opera scenes in the Godfather III, and the steps where Mary dies instead of Michael. You can take a tour of the entire theater as well, and take in the view from the Royal Box, imagine yourself looking down on the guest present on that fateful night. There is also a lot more to Palermo than the Godfather, and you should make it a point to explore the city a bit further. There are bars and restaurants to cater to any taste, and you can make a stop there between visits to museums and churches. If you are visiting Sicily this year, whether it be for the beaches, the sunshine, the history or the inland, make sure to explore more than just the sea and the sun. The island is brimming with wonderful spots to explore, olive groves to offer shade and walls to imagine yourself hiding behind, as the mafia roams on the other side of the road. Naturally, you do not need to be a Godfather fanatic to visit – but if you are just another body lying on the beach, with the novel in hand, sipping a Margarita while the beauty of Taormina is lounging in the evening sun, you won’t feel one bit out of place.